Anne S • This entry was posted in Cross Stitch, Exchanges, Finishes, Great Pumpkin Challenge 2010, Humbug, JBW Designs, Just Nan, pillows, Stitching Smalls and tagged Cross Stitch, Exchanges. Bookmark the permalink. 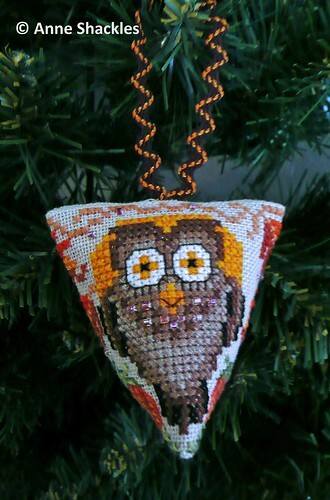 They’re both really pretty, but the owl humbug is just super! I love that little humbug! Both pieces are lovely, Anne. I bet Lisa is thrilled! What a beautiful gift. 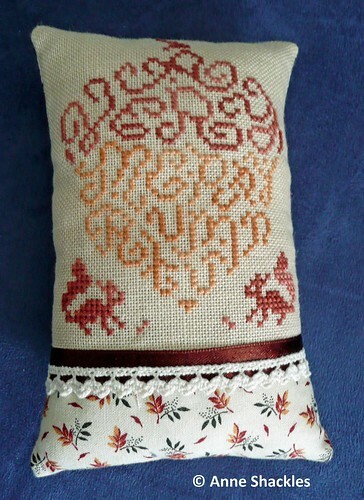 I love the humbug, I must stitch it seeing as I have it kitted up. Awww, so cute! Love them little owls! That’s a lovely exchange Anne. I love the colours and also the fabric on the pillow. I’m usually a lurker, but that humbug brought me out of hiding! Adorable and PERFECT! What a lovely exchange parcel. Love your finishing on the pillow and the owl is just way too cute. What lovely finishes! The humbug is too cute!